There’s a lot of attention right now on the next Apple iPhone iterations. It’s widely thought that the iPhone 5S will be a minor refresh and that we’ll have to wait until the iPhone 6 to get more of a revamp. We have often said that the iPhone 6 needs to offer something truly groundbreaking and today noticed that an old concept video showing a projection feature is being reported on again. However, we believe this idea needs to die, as it’s simply not practical. Recently we have hoped that Apple has something up its sleeve that will really attract attention to the iPhone 6. In our opinion Apple really has to come up with some more innovative ideas to prevent the iPhone becoming stale and to keep up with the Android competition from phones such as the Samsung Galaxy S4 and HTC One. At the weekend we told of the possible inclusion of Corning new Lotus XT Glass for the iPhone 5S or 6 but while that would be a welcome addition it’s not a change that users could actually see. Nevertheless it is something that COULD actually happen rather than pie-in-the-sky. 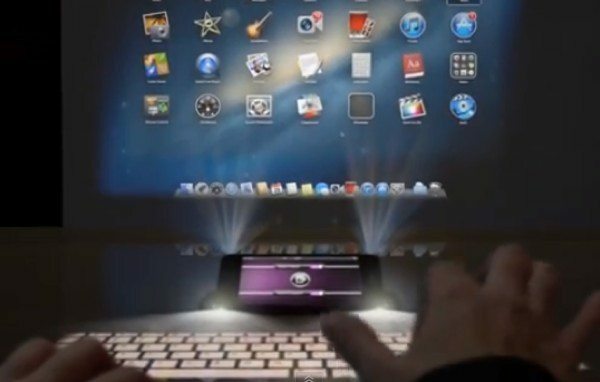 Way back in December we published an article about an iPhone concept video regarding a projector feature for the phone. This phone featured a projector as a work interface and some transforming actions that enabled the phone to open up and project a virtual Mac keyboard on the desk or virtual Mac display on the wall. The main section of the handset could flip up from the ends to create a stand enabling this. While we thought this was a clever idea we also pointed out that the battery demands of such a handset would be excessive and a way round this would have to be developed before such a device could actually exist. Also of course users would have to be sitting in a dark room to make this work, which would not be practical especially in a workplace, while the projector idea could also lead to overheating problems. If the iPhone featured water-cooling, as we recently spoke about with the NEC Medias X 06E, then this idea could possibly work at some point in the future when battery technology could meet such requirements. However at the moment this would seem to be a non-starter as we’re pretty sure that Apple would not consider a water-cooled iPhone. We’ve noticed some sites such as Mashable, have posted about this video again now as though it’s new but the whole concept is really rather pointless when you think about it. We say we need to scrap the idea of an iPhone 6 with a built-in projector although Apple could consider a projector accessory for those that want such a thing. In the expected absence of a major upgrade with the iPhone 5S though, Apple does need to come up with something really trailblazing for the iPhone 6. Hopefully it will be an idea that could actually come to fruition rather than something that would just be too impractical at this stage and that would also add exorbitant costs to the price of the iPhone 6. We’d love to hear your views on this though. Do you agree that this projector idea is simply not viable? Can you think of any ideas for the iPhone 6 that could truly be described as groundbreaking and that could practically be developed? Let us know with your comments. I think Apple needs to redesign the IPhone & I think they should design some kind of Android like…I-droid by Apple & jump on the bandwagon & help improve Android ! Yes, extraordinary! A big YES!!! It would be great for the future and for us.Just take the time Apple need to created it!!! Apple needs to stop focusing solely on simply improving existing features on the iphone..i.e. sizes, colors, etc and instead focus on cutting edge ideas and technology that elevated the company to where it is today. If this user concept video was reality. That would solidify Apple in the tech world of today much like the ipod did 12 years ago. We do not think that, simply by adding this feature of a Projector concept, is not going to win the customers mind. It could be a feature to feature, with slot for memory, storage, etc.